I've been living in Surfers for 2 and a half months now... And I'm loving it! Loving it so much that I have not spent much time on my blog. Oops. I have found a job, doing a role I have never done before. This has it challenges and to top it off I am catching public transport to work which adds an extra 2 hours to my day. No more excuses from now on. 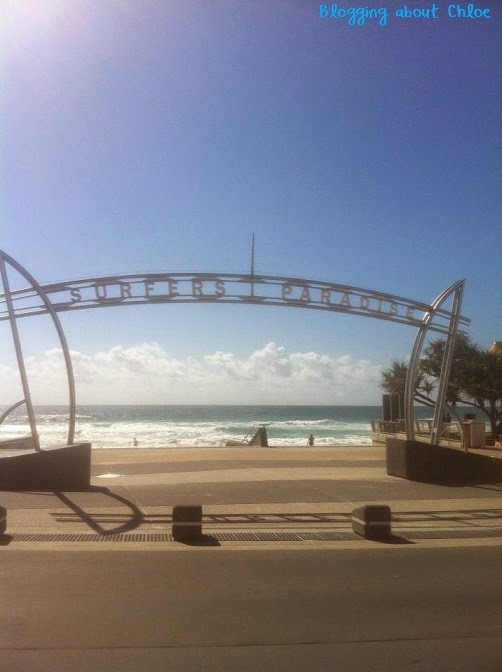 I thought it would be fitting to do a post about the reasons why I am loving life in Surfers Paradise. 1. I can see the beach from my couch. 2. Rent is heaps cheaper in Surfers than in Perth. 3. It is easier to obtain a rental. Brent and I got ours within a week and neither of us had a job at the time. 4. Because it's a tourist area, the clothing stores compete with each other. Yay for sales. This also means it's no drama's to find an outfit for the weekend, especially since my favorite store, Sportsgirl is a minute walk away. 5. There are a lot of restaurants around us and they also compete with each other which means really great meal deals ($10 lunches, $12 dinners, $4 wines). 6. Again because it's a tourist area, the city of Gold Coast hosts a lot of free events. Last weekend I saw a cooking demonstration for free. 7. I don't have to get in my car to go to the beach. 8. The markets run on the beach every Wednesday, Friday and Sunday. I love the markets, especially when the stalls sell home made crafts. 9. I don't have to get in my car to do a food shop, woolworthes is a minute walk downstairs. 10. Wet and Wild, Movie World, Dreamworld and Sea World! 11. As I type this I can hear the waves crash onto the shore. 12. Walks on the beach. 13. Moving state has challenged me professionally, I have had to step out of my comfort zone of knowing everyone in my industry. I have a new job as a kindy teacher which is something I haven't done before. I don't think I would have jumped into this role like I have here if I was still in Perth. 14. Moving state has bought Brent and I closer. 15. Its almost May and today I was wearing shorts and a singlet. 16. Ben and Jerry's is downstairs. 17. Byron Bay and Noosa are a drive away. Can't wait to do a road trip soon. 18. Mornings on the balcony watching the surfers. 19. The take-out options and dine in options are endless. 20. There is a sushi train across the road and its delish! 21. Many of the pubs have happy hour (there is no such thing as happy hour in Perth). 22. Cheap flights to Melbourne!! Seriously the list could keep going!